Experience a unique philosophy in the art of well-being in the southern hemisphere. 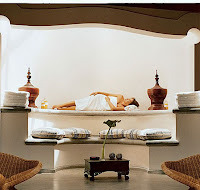 The Spa at Four Seasons Resort Carmelo offers the balanced harmony influenced by yin and yang – the male and female balance in life; the sun and the moon; day and night. With simple, caring touches, the spa pays special attention to the senses: scents to help you feel alert yet peaceful, natural sounds to ease your mind, exotic colours and images ... treatments that will soothe and refresh mind, body and soul.